You will want an approx. 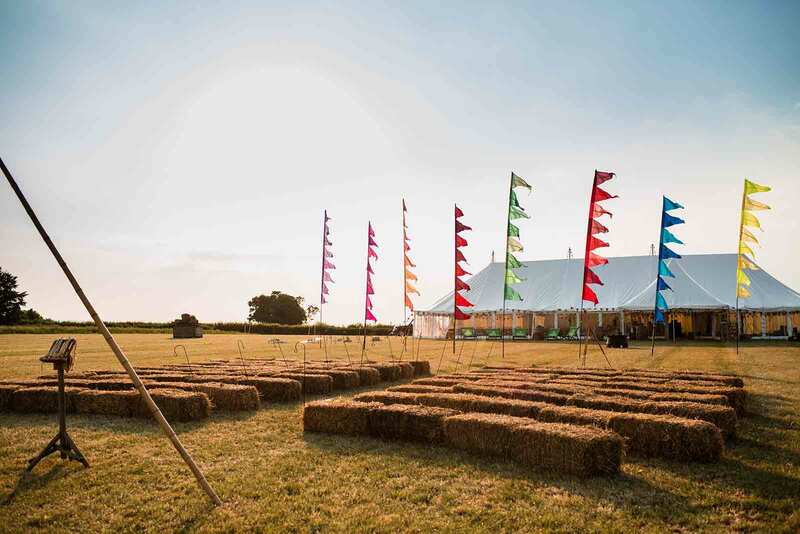 idea of how many guests you want but don’t worry about this too much as the beauty of a field event is that everything can flex right up to the last minute but you’ll need to know if you are looking at a main space to seat 50 or 200. 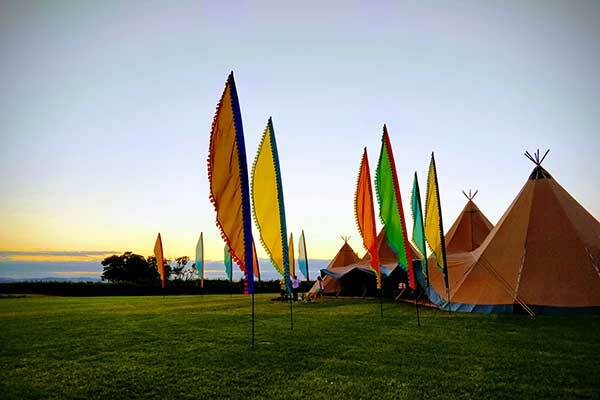 First decide on what style of marquee suits you and your budget. There is a whole range of options from Tipis, Traditional Pole Marquee, Stretch Tents, Yurts, Circus Top Hat, Geo-desic Dome. They all offer something different; character, light, architectural beauty, fun… the list is endless but narrow your search and speak to a few of our friends of the field to kick things off. You’ll soon decide what works for you! The next major consideration is what style of food and drink you want to offer your guests. This is often a key centrepiece to your event so important to get what you want. 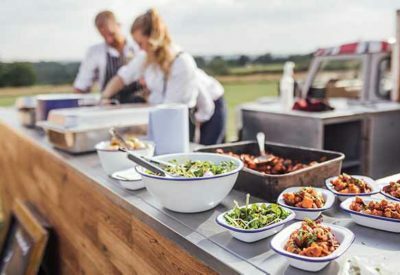 Again we have friends of the field to help you on your way but you’ll need to think about whether you are having a sit down meal with service, buffet or sharing platters?or more of a festival style queue up and take a seat option. It’s great to make a feature of the catering if you can so don’t have them hiding away out back. This is where The Wild Oven really come in to their own!A bar can be set up in your tent and you can sort all the drink out yourself and offer a self-service option, hire a couple of youngsters to serve for you or get someone in to set up and run a pop-up bar for you. The Roaming Caravan is a great example of creating some fun and style from your bar set up. Guests want to party in style and no better way to get the crowd moving than a live band. That is their purpose and they will know what to play when to create the best party vibes. 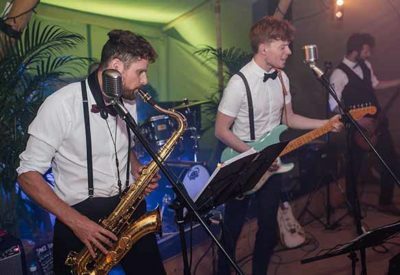 We recommend a band that is versatile to play a few of the old motown classics but also has a good repertoire of modern covers to get you all singing your hearts out. Certainly less glamorous and less important than the above but you’ll need loo hire, electricity, water and waste disposal. 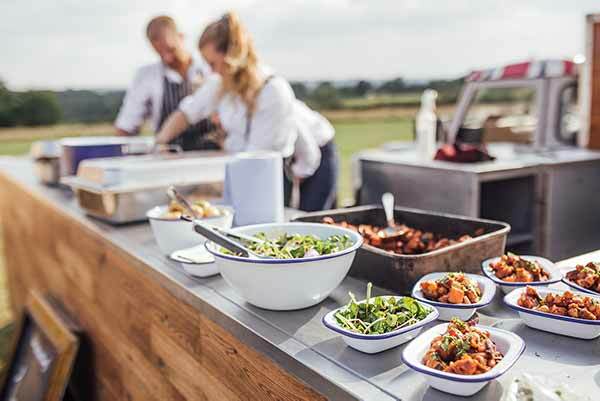 We offer electricity up to 9KvA mains electricity and drinking water on site so that should cover everything unless you’re planning on feeding and drinking 200 guests using electric ovens and tea urns but most catering is gas powered. Loo hire and waste disposal we can source for you as it’s less personal to your own bespoke requirements. 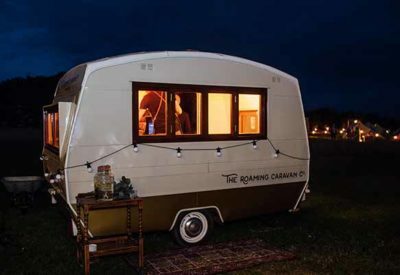 We can offer luxury trailer toilets (not your smelly festival portaloo) that come with smart, clean cubicles, wash basins, mirrors and hot water. We can also provide a skip so clean up Sunday is breeze! 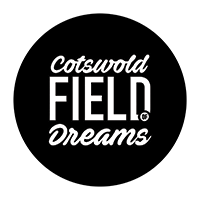 With these four elements planned up front and taken care of as your first steps after booking the field, the rest will all slot in to place. You’ll have a clear idea on what theme or style of event you’re going for. The rest is in the detail and finishing touches to make it special to you… What to wear, what speeches to have, favours, flowers, seating plans, games, fire etc and we can help give you some inspiration but pinterest is also a great place to look at the detail. And there you have it… You’ve booked your venue and locked in the foundations to your dream day. Previous PostWhat style of venue is right for us?